Most of the people Jailbreak their iDevices for maximum customization and thus enhance the overall experience on their iPhone, iPod or iPad. Cydia is the best way that helps you to get the most out of your iDevice with the help of its plethora of Tweaks and Apps. While there is iTunes for unjailbroken iDevices, there are a plenty of Free music Apps in Cydia for Jailbroken iPhone, iPad or iPod that help you to maximize your Music experience and enjoy it without breaking the bank. In this post we have collected 3 awesome apps you can use to listen to music for free on your jailbroken iPhone or any other iOS device. This app helps you to access and listen to free music by directly streaming them from the internet. You can then create a playlist or choose your favorite songs that you can take with you every where with your iPhone, iPod or iPad. The fact that you stream the music also makes this App legal. 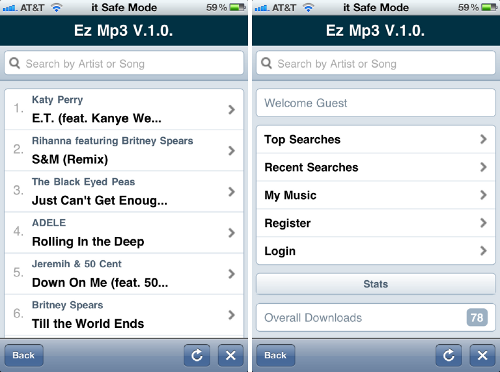 Other features include a built in Radio, 22 genres and top 25 radio stations plus a daily updated list of Top 100 songs. MusicDog is another awesome App for Cydia to enjoy free music via streaming. The app can be downloaded for free from Cydia store and is pretty intuitive and functional with its huge music data base and quality features. This app is just like Spotify but only it can play music both Online as well as Offline. All you have to do is register your device and start browsing your Favorite music, add then add them to your Playlist and you are ready to take your music with you anytime, anywhere. dTunes is a free Cydia App that is an iTunes equivalent for your iPhone, iPad or iPod and helps you download and play music and videos. It also provides direct access to Music and Video sites for directly downloading files. It also has a built in media player. You can search for any song and either play it directly or download it to dTunes. You can also manage your songs individually and name them accordingly directly using the dTunes. You can also watch Youtube videos and download them from different sources. You can also use GroveShark to listen to music but there is a fixed monthly charge of $9.99 for the service. Yes, the only difference is that iPhone-only apps open as small-size app on iPads.